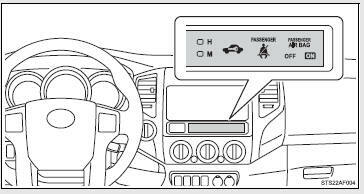 *1: These lights turn on when the engine switch is turned to the ON position to indicate that a system check is being performed. They will turn off after the engine is started, or after a few seconds. There may be a malfunction in a system if a light does not come on, or if the lights do not turn off. Have the vehicle inspected by your Toyota dealer. *2: The indicator flashes to indicate that the system is operating. *3: The indicator light comes on to indicate a malfunction. *4: The indicator flashes to indicate a malfunction. 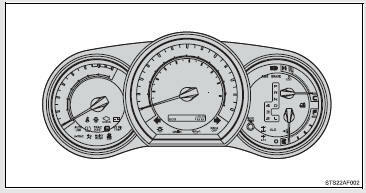 *5: For 2WD models, even though there is no function of deactivating the curtain shield airbags in a vehicle rollover, the RSCA OFF indicator turns on briefly when the engine switch is turned to the ON position. But this is not a malfunction. Should a safety system light such as ABS and the SRS airbag warning light not come on when you start the engine, this could mean that these systems are not available to help protect you in an accident, which could result in death or serious injury. Have the vehicle inspected by your Toyota dealer immediately if this occurs.